If when you say “alternative rock,” you really MEAN “alternative,” and you enjoy the sound of synths, get yourself down to the Stage AE on Sunday 28th May 2017 for Future Islands – arguably one of the most unique bands to come to public prominence in the last decade. Get your tickets now to a show you’ll never forget!! The Baltimore-based, synth-driven rock band will be touring in the wake of the success of their most recent release, the playfully ambigiously entitled “Singles,” the leading track “Seasons (Waiting on You) of which was chosen as the best track of 2014 by Pitchfork Media, Spin, and NME!! After developing a strong fan following with their first three releases, the band rose to massive global prominence with several TV performances in 2014, including a particularly memorable one on “Later…With Jools Holland,” which made such an impression largely due to the onstage antics of deceptively ordinary-looking frontman, singer and lyricist Samuel T. Herring, who startled viewers with his unusual rough and raspy vocal – going all the way from throaty to a full-on guttural scream – as well as his eccentric dancing, ranging from drastic bent-knee box step to pole-dancer worthy shimmying, dramatic gesticulations, and bizarre facial expressions. 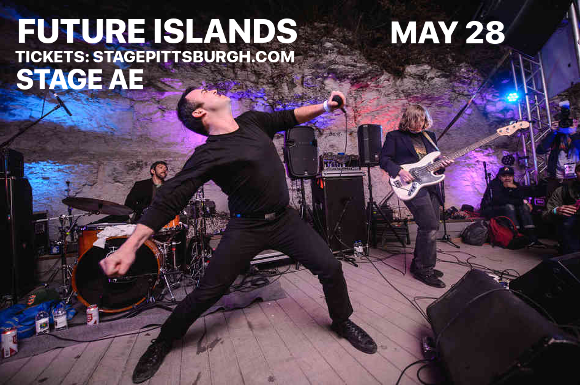 Like it or not, Future Island’s live performance is captivating – and they bring this strange allure with them to the Stage AE. Don’t miss out on a performance that will certainly stay with you for ever after – grab your tickets now! !